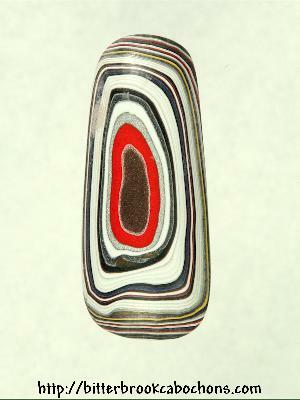 A lot of the Fordite "rough" I'm seeing lately was broken off pipes. Looks like a piece of pipe insulation when you look at it from the end. This cab was cut from the same chunk as this one. The front of this cab is the OUTside of the curve; the front on its cousin is the INside of the curve. 39mm x 16.5mm x 6.5mm. Weight: 19.55 carats.